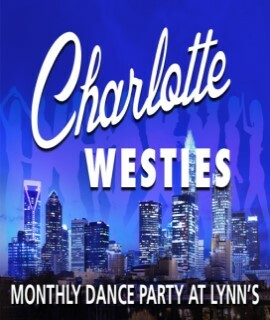 CLICK HERE for the flyers containing more information on current dance lessons or upcoming special events at Lynn's Dance Club. Need a place for your party? Consider Lynn's for your birthday, anniversary, bachelor/bachelorette, class reunion or other special event. We have reasonable rates and can accommodate your special needs. Call us at (704) 527-3064 or Email us to book your event. Thursday, April 25th - CSC IRS Party w/DJ JR Norfleet - Put down those tax forms and come join us at Lynn’s for the Charlotte Shag Club's I'd Rather Shag Party on Thursday, April 25th. This is a Pot Luck party so please bring a covered dish to share. Click Here for more information. Friday, April 26th - Boogie Down Dance Party - '70's Costume Party - Come join us at Lynn's for a '70's Costume Boogie Down Dance Party on Friday, April 26th. There will be a Hustle lesson from 7:30 - 8:15, then DJ Tim Boggs will start the party. Click Here for more information. Lynn's Gift Certificates are available for purchase for the holidays or anytime you need a gift. You set the amount you wish to purchase for your gift. Please see any of Lynn's staff to purchase your gift certificate, or for more information. Lynn's is a private club and must adhere to North Carolina laws. To be in compliance with that law, Lynn's must offer membership to it's customers. Lynn's regular membership is only $40.00 per year. Click here to download our membership application. Check out the great series produced by WTVI's Carolina Impact featuring Lynn's Dance Club. Check out former WBT radio host and WBT Hall of Famer HA Thompson's blog on his recent visit to Lynn's Dance Club. Keep up to date on all events happening at Lynn's by subscribing to Lynn's Weekly Newsletter. Just click the Subscribe button below and complete the form. Click HERE for the Current online newsletter.